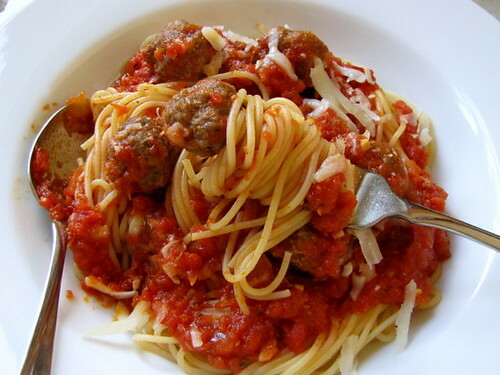 Food Friday: Spaghetti with Meatballs ~ I Can Do That! This is my favorite spaghetti, with garlicky marinara sauce topped with meatballs and freshly grated Romano or Parmesan. Very yummy and comforting. In a large glass bowl, mix everything together, it should be moist. Fry a teaspoon and adjust seasoning. Form into balls, from teeny to ginormous ones and bake in a 375°F oven until lightly browned. Continue cooking in a simmering pan of marinara sauce for 20 to 30 minutes. now that got me drooling! sooo good! hmmn, garlicky marinara sauce--love it, too. I love all pasta but the best is spaghetti and meatballs. Oh! I love mixing pork and beef for meatballs...your spaghetti with meatballs look so tasty...great meal :-) Beautiful picture! I normally buy here mixed ground pork and beef...never realized it until now lol. Yummy looking dish! Love marinara too!